Back in the Summer months of 2014, a horror film burst onto the scene and not only delivered a heavy dose of scares but also delivered big at the box office, a rarity for horror films released in the Summer. And so it comes as little surprise that James Wan, the man behind the Saw and Insidious franchises, is back with a sequel to one of his biggest hits. 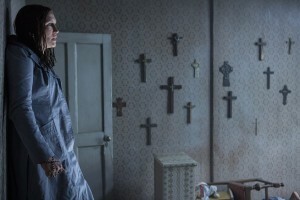 Led by returning stars Vera Farmiga and Patrick Wilson, The Conjuring 2 centers once again on real-life paranormal investigators Ed and Lorraine Warren who this time head to London to take on an entity that is haunting a little girl and her family. You can check out the first trailer for The Conjuring 2 below. It will hit theaters everywhere June 10th, 2016.